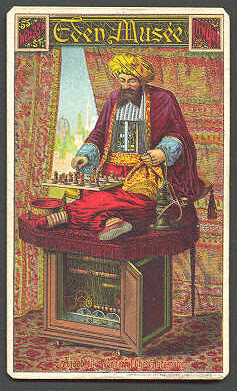 If you're wondering why I'm honoring Ajeeb as "RotW" instead of his more famous chess-playing automaton predecessor "The Turk" or the more sophisticated successor "Mephisto", it's because of its bizarre story. Ajeeb was built in 1865, several years after the turk was destroyed in a fire. Capable of both checkers and chess, it lost three games of the 900+ played, and never lost a game of checkers. Opponents included Houdini, Sarah Bernhardt and Teddy Roosevelt. After an extensive tour of Europe it played throughout the U.S., eventually settling at Coney Island sometime in the 1880's. Obviously, Ajeeb wasn't 100% mechanical; An operator was concealed within the cabinet. For much of the time this was Sam Gotski, chess pro. One day his understudy was operating the machine when a coney island visitor got so pissed over losing, he shot Ajeeb in the torso, killing the man inside. To conceal the shameful secret of Ajeeb not being a true robot, and due to the transient nature of this particular apprentice, they successfully disposed of the body without consequence. Sometime later, Sam quit his job, complaining that Ajeeb was moving about on its own accord. He disappeared from New York never to be seen again. Ajeeb went through two more operators, but they both reported to friends and family that Ajeeb seemed to be moving independently. One of them refused to play anything but checkers, because Ajeeb sometimes made his own moves with chess. Other operators controlled, and were controlled by, the machine into the 1920's, including Albert Hodges, former U.S. chess champion. It was allegedly destroyed by a fire in 1926, but sightings and rumors persist to this day. It is believed to reside somewhere near Ontario. Neighborhood clock workers and machinists suspected of servicing Ajeeb over the years are keeping quiet, describing it as little more than "A golden means between machine and spirit not fully known". Does it contain the soul of the man who died within its body? Or has it always been a creation that surpassed the will of its creator?